← Over the Edge? Not Me! Hearing the words “it’s cancer,” threw Sara Phillips’ life into chaos, until an unexpected turn of events and a chance encounter with a stranger changed everything—his name was Ben. Based on real events, Ben and Sara discover that when all else fails, healing can come in the most unexpected ways. Chilling and heart wrenching, His Name Was Ben is a triumph over the devastating circumstances and fear experienced when faced with a terminal illness. In this narrative, the power of love conquers shadows and transforms the very nature and meaning of what it is to be fully alive. From the award winning, best-selling author of, The Persecution of Mildred Dunlap, comes a story filled with soul and passion that will leave the reader thinking about it for days after the last page is closed. 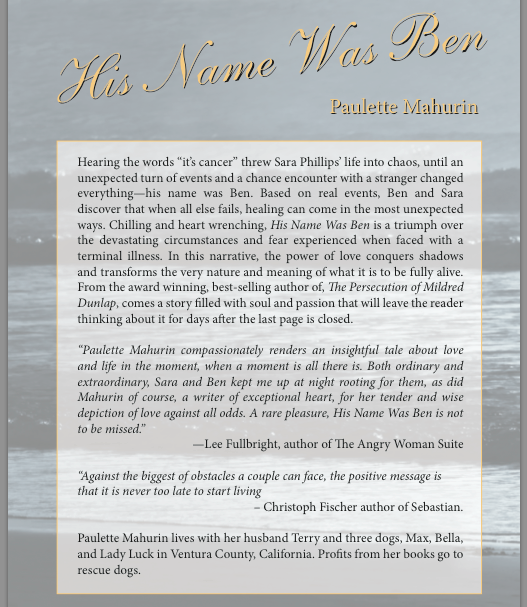 “Paulette Mahurin compassionately renders an insightful tale about love and life in the moment, when a moment is all there is. Both ordinary and extraordinary, Sara and Ben kept me up at night rooting for them, as did Mahurin of course, a writer of exceptional heart, for her tender and wise depiction of love against all odds. A rare pleasure, His Name Was Ben is not to be missed.”—Lee Fullbright, author of The Angry Woman Suite “Against the biggest of obstacles a couple can face, the positive message is that it is never too late to start living.” –Christoph Fischer author of Sebastian. Paulette Mahurin lives with her husband Terry and three dogs, Max, Bella, and Lady Luck in Ventura County, California. Profits from her books go to rescue dogs. This entry was posted in ABOUT THE BOOK, AMAZON, ANIMAL RESCUE, AUTHOR/BOOKS FEATURED, PERSONAL POSTS, PHOTOS, PRESS RELEASES & ARTICLES, PROMO, Santa Paula Animal Rescue Center. Bookmark the permalink. 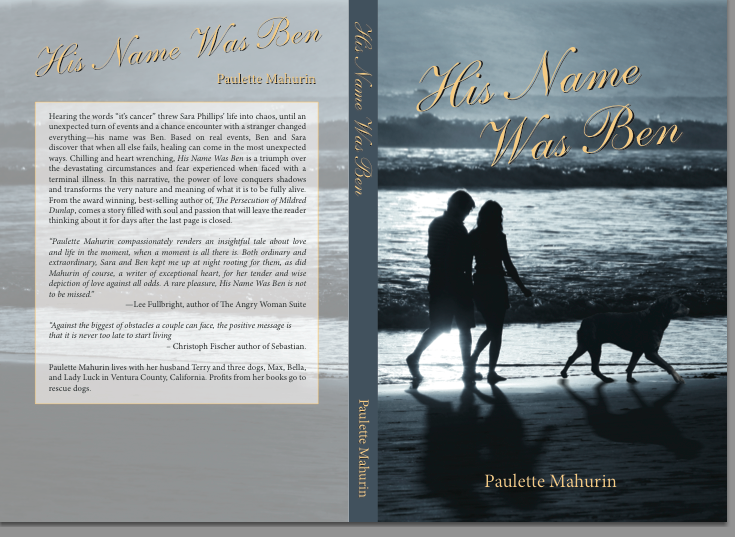 Paulette’s new book, His Name Was Ben, is due out soon. As a short story, it won an award and was published when Paulette was in university. She’s expanded it into a full length novel. I can not wait to get my hands on this book. I think that It will be even more successful than Mildred Dunlap, (my shortened title). Here’s wishing you great success with the new book. His Name Was Ben, from the preview I’ve just read sounds great, and I look forward to reading it. I presume you will let us know when is becomes available. Wishing you continued success, for you personally Paulette, as well as for your wonderful animal care cause. Wow powerful. And heart wrenching. You inspire me. Ism just starting to collaborate with another on a writing project. It us my first and I am excited. You are a great writer. And do so many kind things from and because if it. I didn’t know you were writing another book. Can’t wait to read it! Love the cover – very captivating. Congratulations Paulette. 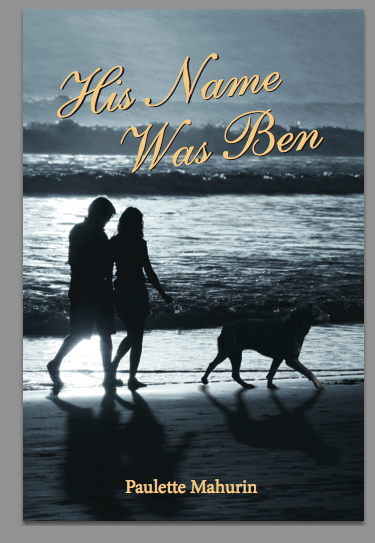 I am very much looking forward to reading His Name Was Ben! I can hardly wait!!!! and hugs to Bella, Max, and Lady Luck! I am looking so forward to reading it! Know what it’s like to get that diagnosis, and survive, will make this book even more meaningful. Looking forward to being able to download it soon and knowing that the proceeds go to help rescue dogs like my Zoey. Bless your sweet heart for adopting your Zoey and your kind words of support. You’re a great cyber friend, Jeri. You’re helped me with your honest feedback on my first one and with your posts. Someday I’d love to be able to work directly with you on the editing side. And, if anyone sees this Jeri Walker-Bickett is a great writer and offers editing services that are top rate. A real pro. You’re too kind, Paulette. Thank you. Congratulations. Now you have to change the name of your blog to Mildred & Ben! Looking forward to reading your new book. I love the cover! The book sounds fascinating. Congratulations! You are such a warm person.Wish you all the best and great reviews on your books.